The complete pom.xml file I use for Android projects is as follows. 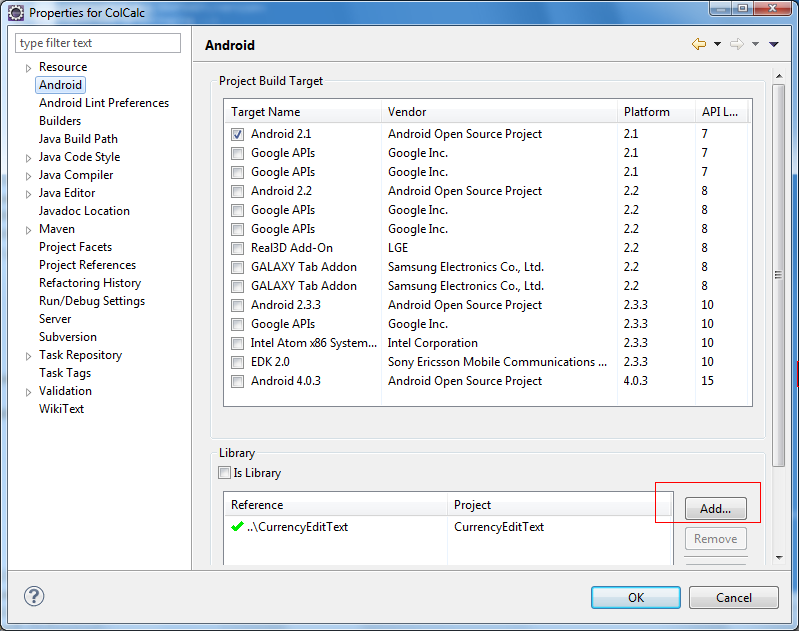 Please remember to set target Android SDK and java version in file above. In my case Java version is 1.6, and SDK is 7. Keep the same config in AndroidManifest.xml. The most important change to notice is the packaging tag at the beginning – set it to apklib. Please note also, that your apklib project has to be marked as Android Library in its properties (check it in the same project properties window as shown above). Maven plugin however should automatically mark this project as library, based on its pom.xml file. All instructions how to do it, You will find here. Here is plugin’s website. Any additional info will be provided there. Moreover here is very detailed description about Android development with Maven. Here is sample pom.xml from plugin’s website. The most important differences between this, and standard pom.xml are marked with green. If you need some more info on basic configuration of pom.xml for m2eclipse, look here. Introducing Maven to Eclipse projects from scratch was described in my previous post. Now the basic usage and configuration will be described. You can add it by filling in groupId, version etc. manually or search Maven repository by keyowrds. 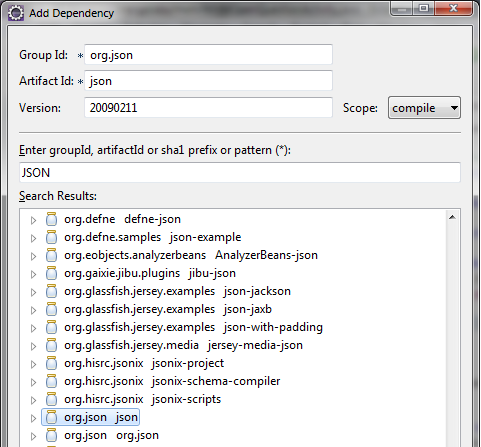 For example searching for JSON lib looks like in the picture below. After confirm, you will see changes reflected in pom.xml file. Note: Setting source folder by eclipse standard way (Build path -> Configure Build Path) will have no effect, because it will be reverted after Updating Maven Configuration. If You have problem with selecting targets (empty goals list), see solution here and corresponding bug description here. Here is short instruction how to incorporate Maven into existing Eclipse projects from scratch, step by step. The goal of Maven introduction presented here is quite generic, however I installed Maven to manage dependencies (jars). Maven build, installs or clean functions are not used by me. If You need to know more about maven itself – this screencast is good start. I recommend m2eclipse as it is most popular and works quite well. It is supported by Eclipse: 3.6 Galileo and 3.7 Indigo. Install it by ‘Install new software‘ Eclipse option. Update site link you will find on this site. 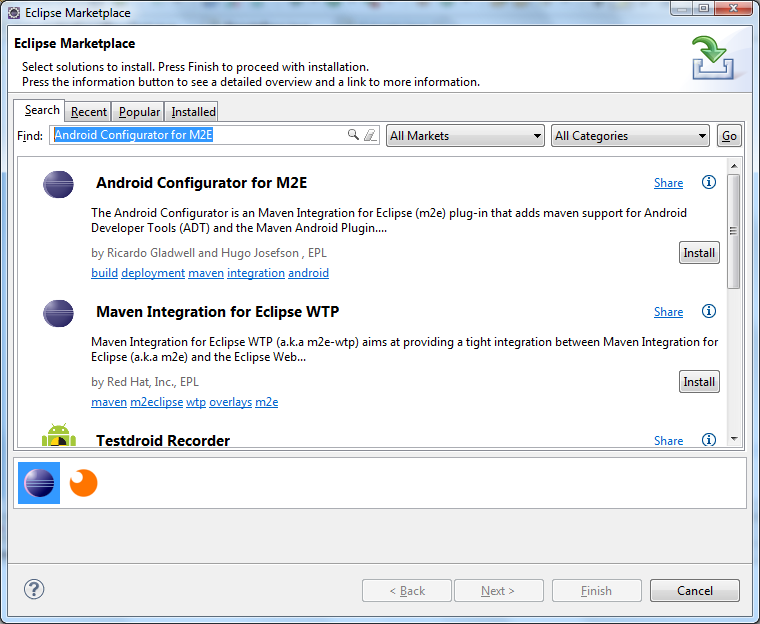 This will install its own Maven instance, so you don’t need to install Maven yourself – m2eclipse will handle it. 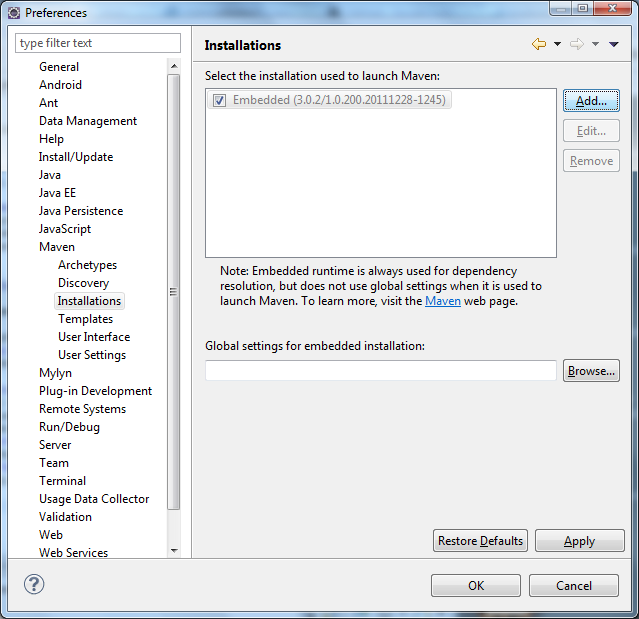 However manual Maven installation is necessary if You need another version that is provided in m2eclipse by default. Some very good introduction about m2eclipse is here. If m2eclipse doesn’t suit you, then you can find another plugins comparison here. The best one decided on StackOverflow.com is however m2eclipse. groupId – in fact this is main package name that is used in eclipse project. Param states that project belongs to some group, pointed by package name. archetype – project type. This is similar to creating new project in Eclipse, where You choose on of the project types at the beginning (Android project / Java project / Dynamic Web Project etc.). Like Eclipse project types, Maven provides its archetypes. Choosing proper one, eases project configuration. Maven preconfigures its structure and pom.xml file. dependencies – list of all jars or another workspace projects required for Mavenized project to run. Referenced workspace projects should also be maven ones. After making changes in Maven config (pom.xml file) you will have to update project configuration to reflect these changes in project. On another computer, where this project is used it is enough to install m2eclipse (point 1.) and trigger ‘Update Project Configuration’ (point 3. ).